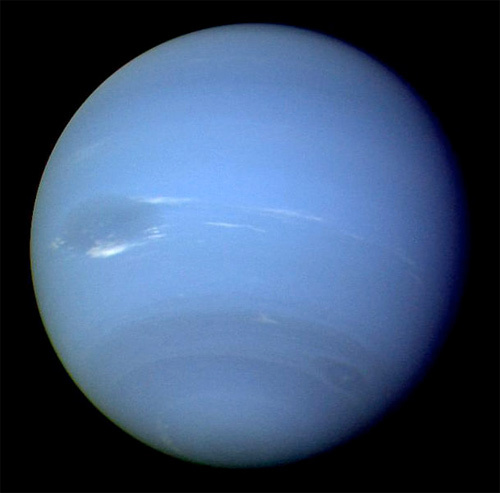 1846: German astronomer Johann Gottfried Galle, knowing exactly where to look, confirms the existence of an eighth planet in the solar system, Neptune. Galle was not the first astronomer to see Neptune — Galileo, puzzled by the changing position of what he thought was a fixed star, had sketched the movement in 1613 but never published his findings. Others had seen it, too, but Galle, working at the Berlin Observatory, was the first to observe Neptune while understanding exactly what he was looking at. By the time Galle fixed his gaze upon Neptune, the existence of a planet beyond Uranus was widely predicted, and its position had been intensely calculated. In fact, other astronomers were quarreling over who owned the priority of discovery. A Frenchman, Urbain Le Verrier, had worked out a complicated set of mathematical predictions based on anomalies in Uranus’ orbit, and those, in fact, were what Galle was using when he spotted Neptune. Le Verrier had also taken care to make his predictions public. Meanwhile, the young British mathematician John Couch Adams, working independently, had reached similar conclusions, but confined himself to sharing the data with colleagues at the University of Cambridge. The key to their calculations was Uranus. Irregularities had been observed in the planet’s orbit, irregularities that suggested possible gravitational interference by another heavenly body. French astronomer Alexis Bouvard first noted this in 1821, when he published observations of Uranus’ orbit. By 1846, Le Verrier had not only completed his calculations for an eighth planet, but had determined its mass and orbital path. When his work was met with indifference by the French astronomical fraternity, Verrier sent his data to Galle in Berlin, who — assisted by his student Heinrich Louis d’Arrest — discovered Neptune that very night. Galle found Neptune less than 1 degree from the position Le Verrier predicted it would be. Adams was a gracious loser, giving full credit to Le Verrier for the information leading to Galle’s discovery. Others in England, however, were less diplomatic. In addition to some cross-Channel rancor, there was also criticism of those who could have been expected to act as Adams’ mentors. A proposal by the suddenly interested Paris Observatory to call the new planet Le Verrier went nowhere, and the name Neptune was eventually selected. This article first appeared on Wired.com Sept. 23, 2008.